On June 30, 1994, the Late King Norodom Sihanouk instituted the National Construction Medal (Meday Sthapana Cheat) to recognize contributions towards the reconstruction and development of Cambodia in the wake of the collapse of the Khmer Rouge regime. The Teach Them To Fish Foundation completed construction of Omaneash Primary School in Omaneash Village, Khnar Sanday Commune, Banteay Srey District, Siem Reap Province of the Kingdom of Cambodia (approximate GPS coordinates: 13° 37′ 28.10″ N 103° 55′ 45.62″ E). During the 2016 opening ceremony, Morgan Sizemore (Dartmouth ’19) and Chase Sizemore (Flint Hill School ’18) were awarded the National Construction (Meday Sthapana Cheat) Gold Medal by His Excellency Mr. Khem Bunsong, the Governor of the Siem Reap Province, on behalf of His Majesty King Norodom Sihamoni. 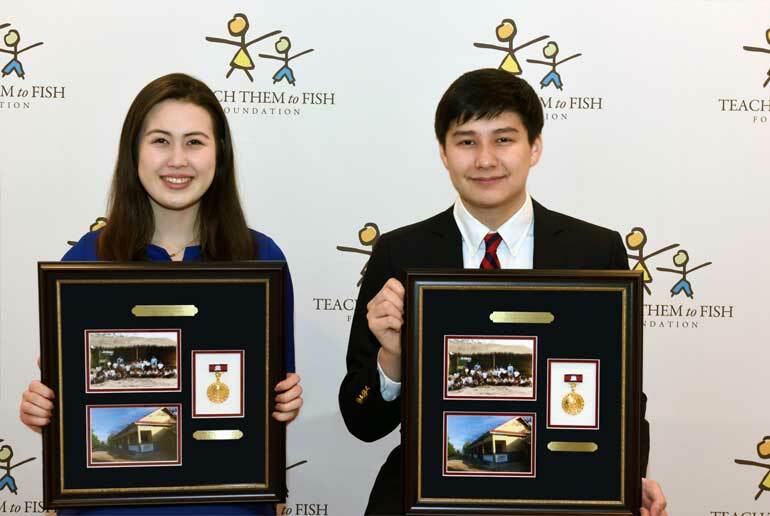 For years, Morgan and Chase, co-founders of the Teach Them To Fish Foundation, have played a pioneering role in the reconstruction and development of the Cambodian education system by building primary schools for underprivileged children and girls at risk for human trafficking in rural Cambodia where children do not have a school to attend. In furtherance of their work, Morgan and Chase have begun renovation of Prey Phnheas Primary School in Battambang Province (their first school in Cambodia) and construction of O’Russey Primary School in Oddar Meanchey Province, in the land-minded jungles, just a few kilometers east of mountains of the Thai border (approximate GPS coordinates: 14° 20’ 28” N 103° 43’ 9” E).